You probably own a half-dozen portable power packs by now, because well, we talk about them a lot. There are certain accessories that are worth investing in that you may not need every day, but certainly come in handy in a pinch. Power and battery packs fall into that category, so we tend to share deals on them whenever we see one. 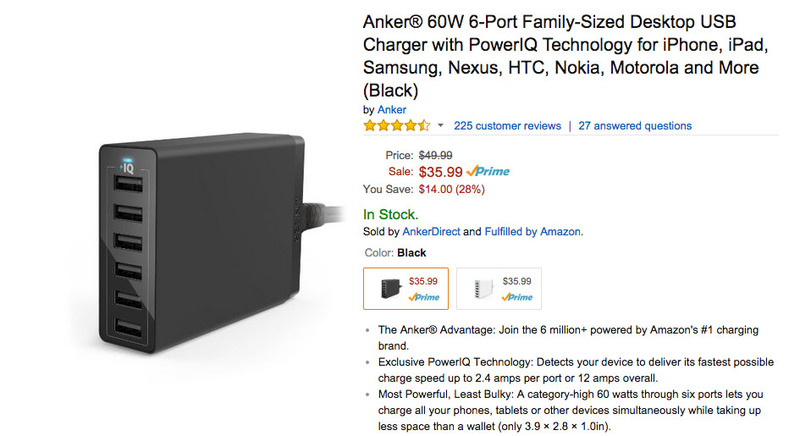 Today, over at Amazon, if you buy Anker’s 60W 6-port USB charger for $35.99, Anker will throw in an Astro E1 5,200mAh battery pack for free ($19.99 value). So not only do you get a powerful USB charger that can charge all of your devices on at once, you get a portable battery pack with enough juice to give most phones almost two full charges. To get the deal, hit up both links below, add both items to your cart, and then plug-in “FE1BLACK” or “FE1WHITE” depending on which portable pack you go with, white or black.